There's nothing like warmth, when it comes to hospitality, that blanket of welcome that surrounds a guest or customer when caring and proactive efforts cause greater comfort to happen while making frigid moments forgotten. As guests contemplate their seasonal choices for leisure and business travel in the new year, global warming may be a genuine environmental concern but global warming takes on new meaning when through the eyes of hospitality and a meaningful service emphasis. In this case, warming the hearts of guests and customers is a weather proof strategy for all seasons in the arena of Guest Experience Management. EVO Sales Manager Welcomes Us. Earlier last year, a February visit to Montreal, during some very chilly days, yielded some delightfully warm experiences due to two very special places in the old city. 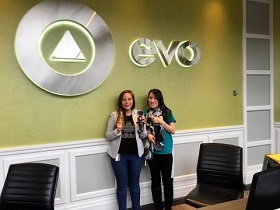 First EVO, a unique residential experience for students attending local universities and colleges, presents a well-located and well-designed environment but it is the warmth of the staff that makes this space especially inviting and rewarding for all who stay there. Our visit began with Dominick who gave us a tour to orient us to the EVO experience before we arrived at our room. Her enthusiasm and sincere interest in our first impressions as she showed us each well -thought out area set the stage for a very positive and informed visit. Even though the temperature outside was 18 degrees Fahrenheit (negative 7.7 Celsius) and the ground covered in snow and ice, Dominick's thoughtful communication warmed us up before even getting to our room and truly made us feel welcome. That warmth continued in the design and setting of our rooms, making it seem more like we had walked into a friend's home than a lodging provider. We had handwritten notes of welcome from the Sales and Operations team and in an increasingly impersonal world, even their online chat team when we needed help, especially Support Agent Melana Noory, continued that feeling of warmth in words and effort. It was as if the team in charge determined 'warmth' was a service standard and priority throughout each facet of the guest (in this case student) experience. With that focus, they explored how to incorporate that standard into operational, physical and especially emotional areas of the EVO experience at all points of contact. Alejandra Presents a Hair Dryer to Save the Day. One moment during our stay especially captured this focus of warmth and caring. We needed a hair dryer but most residents bring their own based on longer stays. Since the freezing weather would have led to 'icicle hair' without drying, we were desperate to find some 'hot air'. Luckily, front desk representative Alejandra came to the rescue, tracking down her own personal dryer for us to use along with her favorite hair gel for cold weather. Her gestures, her resourcefulness and especially her thoughtfulness warmed our hearts along with our heads. 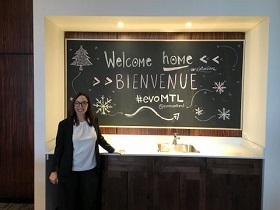 We were delighted that we discovered EVO's hospitality warmth during this very cold February winter and can only imagine how the EVO team delights their student residents all year long. When we left EVO, we wandered through the very icy and cold streets of old Montreal to come upon another delightfully soul warming experience. Le Magasin General is a charming boutique and bistro near the port in the old city featuring eclectic and unusual art, accessories, gifts and treasures of all kinds. The decor, selection and display of merchandise are delightful from the first step, as if discovering a secret closet with extraordinary jewels and magical products. And yet, the best part of all is the authentic warmth and ambiance inspired and role modeled by founder and owner Nicole Madore. I'll never forget my first visit when Nicole walked up to me as I was perusing some beautiful scarves. She focused on me and not my potential purchases and asked if she could help me warm up with a cup of coffee while I shopped. Her caring interest caused me to pause and notice a place that sincerely appreciated me enjoying my time there, whether I made a purchase or not. 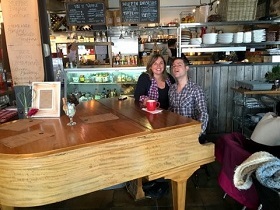 During my next visit, the ambiance was filled with live music from a charming piano player in the Bistro. When I asked Nicole about this wonderful addition she noted that it made the ambiance nicer for her employees as well as her customers and that is what motivated her. She noted that it was important for her to make sure her employees felt as warm and engaged by their place of work as the customers and places great value and priority on the employee experience. She noticed their mood and spirits were enhanced by the music which in turn generated more positive energy for the customer experience. Warming the hearts of employees is a powerful service strategy in any season and showing employees as much or more care than customers is a weatherproof forecast for success. So What Is a Butler, Anyway?